100 metres from University headquarters. PEDESTRIAN UNIVERSITY DISTRICT WITHOUT CARS ! You can come even alone and share the room. We have rooms for all guests, with the facilities you need during your stay here in Bologna. Clean sheets and towel Included. NEW FAST WIFI. Number 3 , Three ! Don't look for a big sign. Signes are not mandatory for the low and we just wrote, for your privacy, our name on the bell by a very small sign. Look for the right address 'Via dei Bibiena 3 ' , beside Kaffeina Kaffe. After h.19.00 nobody will wait you for check in and nobody will open you the door. Due to few very bad clients if you arrive after h.19.00 and you enter into the property inside the door when another guest is going out, you will receive a fine of 100€. Due to check out at h.11.30 ( which is very convenient compared to other properties in Bologna, it is not allowed to leave/drop baggages before check in time. If you arrive for check in or storage before H.13, you can’t get into the property. Guests who enter before H.13.00 without permit of the owner will not be hosted due to unpolite behaviour and not refunded of deposit. Breakfast is not included but we will give you a small bottle of mineral water as “welcome drink” and you can fill it from the tab. Bologna’s water is good ! It is allowed to use fridge, micro wave , toast machine but not the kitchen. Kitchen is not allowed to use for security reasons. Campus and opera is located in an area full of History, Culture but also ideal to meet young people, to rest in best bars, pubs, University clubs, and restaurants with excellent value for money. Via dei Bibiena is a car-free street and 80 meters from the Teatro Comunale di Bologna, 200 meters from the headquarters of the University of Bologna Alma Mater with its museums, 200 meters from the Conservatory, 300 meters from the National Art Gallery of Bologna, 500 meters from the Two Towers and 800 meters from Piazza Maggiore. 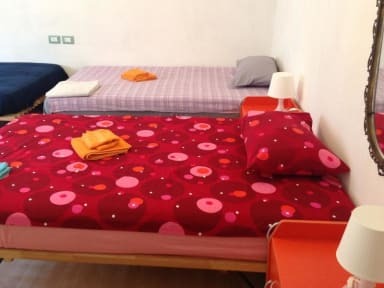 The Central Station is a pleasant 20-minute walk or connected in 10 minutes by Bus C with a stop in Piazza Verdi 50 meters from Guesthouse Campus and Opera. Check in from 13.00 to 19.00 NOT AFTER 19.00!! Please bear in mind that if a property cannot pre authorise your card for any reason, they will email you to ask you for further details. Should they not receive a response from you within 48 Hours they would be then entitled to cancel your reservation due to insufficient card details. If the arrival will be the day after the reservation, the response has to be given by midnight. I stayed for 6 days while looking for a flat in Bologna. The owner is very nice and kind, the breakfast is good and complete and the place is also very clean and tidy . The location is very good too. The only bad thing was the bar located below the hostel, sometimes it could get really noisy. Nice place very close to the twin center. Has the university night life close by. The place was clean and good facilities. Breakfast was self service and well supplied. We were alone on the place no opinion regarding the environment. Danielle was very welcoming and gave us a warm welcome.